This early 19c cottage has been warmed up with the addition of thermally lined, interlined curtains & roman blinds . Square bay windows always pose a challenge & this lovely window was no exception. Our busy client had disliked this room since moving in & was more than ready to make changes. 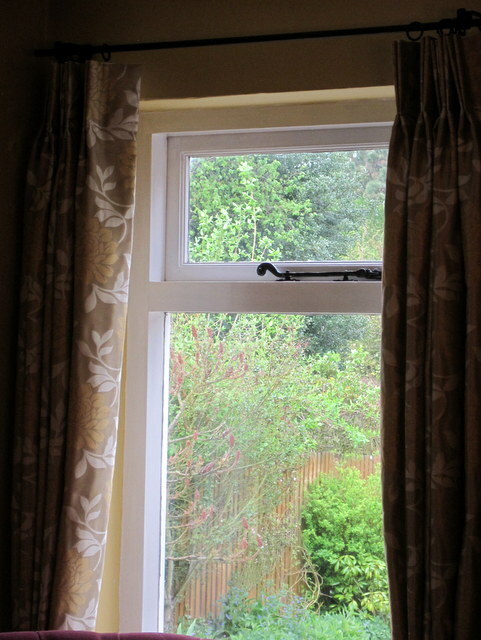 The brief was to replace the old curtains & valance with a smarter upholstered box pelmet & 216 cm sill length curtains. We also needed improve the thermal efficiency & provide some privacy. There was little space to fit the pelmet & track between the window architrave & ornate coving which meant that the track had to be mounted under the pelmet. We selected a Silent Gliss double corded track & had it bent to a tighter angle than usual to allow the curtains to sit on the window sill. 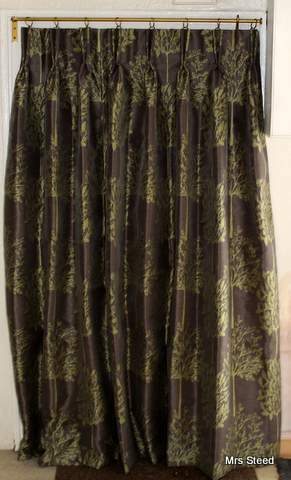 The curtains were interlined & thermal lining was also used. 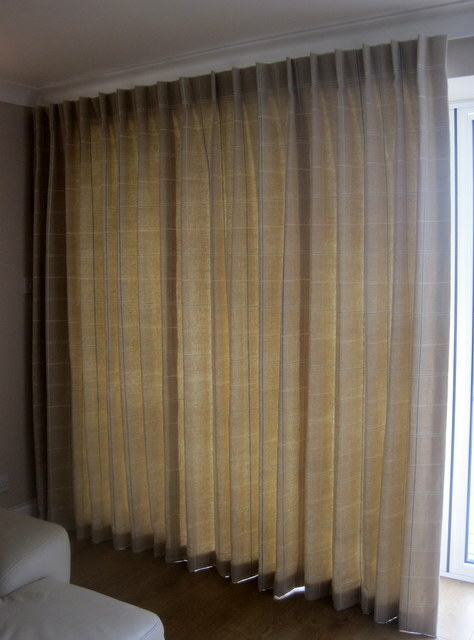 A neat single pleat heading was suggested to allow the curtains to stack back well at the side windows. To provide an element of privacy our client wanted plain voile panels fitted to the lower half of the sash windows but didnt particularly like the usual fittings available for cafe curtains. With this in mind we sourced some brass sockets & rod, the bottom of each panel was weighted with a roman blind rod. Lovely neat contemporary single pleat curtains on a 4m wide Silent Gliss track where minimal stack back is required for when the bi-fold doors are open. The track is perfect for this situation & the curtains glide easily along it with minimal effort. 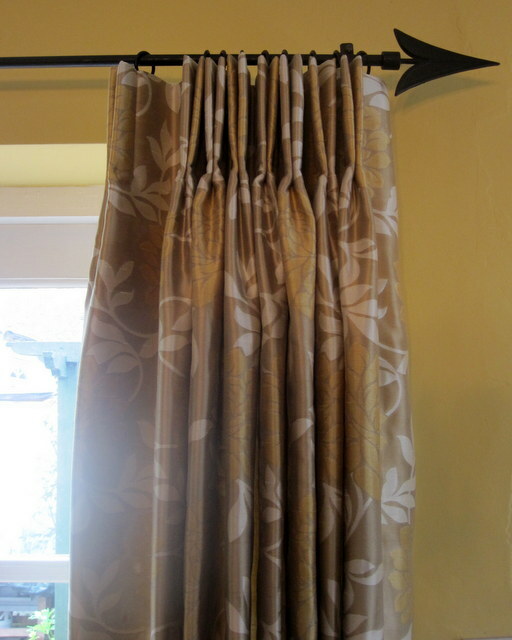 Short curtains with double pleat heading in a Sanderson fabric for a beautiful beamed cottage adds winter warmth. 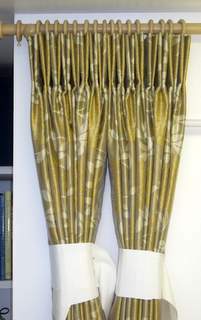 A close up of the double pleats on these short curtains which are hung on a track. Sometimes double pleats instead of triple pleats are more appropriate. Here, for example a minimal stack back was required to let in maximum light.